Porsche has officially announced the name of its new electric GT car and it's going to be called the Porsche Taycan. The Taycan is arguably the marque’s most radical model in Porsche's history – being its first ever all-electric production vehicle. The electric 4-door is to spearhead Porsche’s long-term electrification plans, with a range of plug-in hybrids and full EVs set to join it in the future. According to Porsche, Taycan is a word taken from an eastern dialect and is pronounced ‘tie-can’. It translates as ‘lively young horse’ and is a reference to the horse that’s been rearing up on its hind legs on the Porsche badge since 1952. 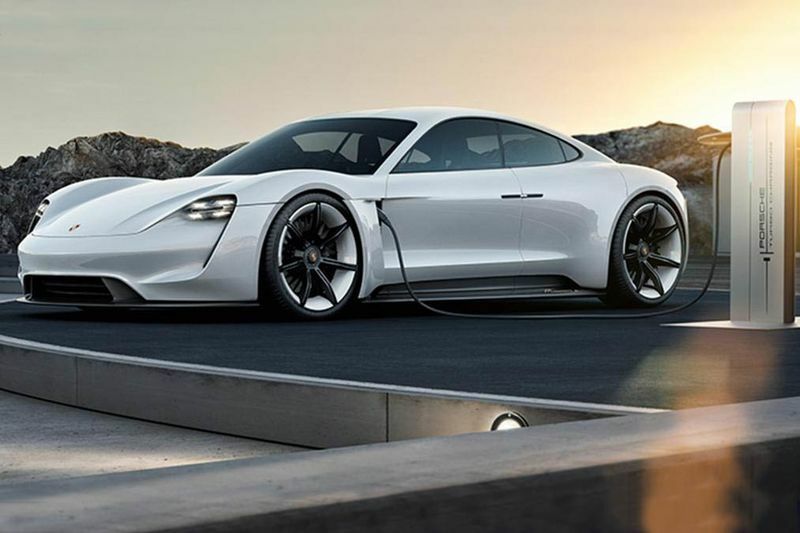 The first signal from Porsche that it was to build a fully electric car came in 2015, when it showed off the Mission E concept at the Frankfurt Motor Show. The production model will get the new Porsche Taycan name and be unveiled fully in early 2019, with customers taking delivery later that year. Prototypes of the Taycan electric saloon have been undergoing development testing for several months. Although the Taycan shares a similar silhouette to the Panamera saloon, the Tesla Model S rival will be more compact and cheaper; entry-level versions priced between £60,000 and £70,000 mean it will carry only a small premium over its main rival. Previewed in the image gallery above, the Taycan will bear a close resemblance to the concept in shape and style, but the rear-hinged back doors and matrix LED headlamps will be adapted for production. Features such as the flared haunches, LED tail-light strip and coupe-like rear end will remain to echo the looks of the 911 sports car. The Mission E concept generates nearly 600bhp via a lithium-ion battery and two electric motors, one on each axle. Porsche claims this powertrain will allow the Taycan production car to cover 0-100km/h in under 3.5 seconds and 0-200km/h in under 12s before hitting a top speed of 250km/h. Crucially, we’re told the performance will be repeatable with the electric car able to accelerate hard ‘over and over again without losing performance’. In terms of range, the target is for the Porsche Taycan cover upwards of 480km on a single charge and Porsche says the 800-volt system can take on 100km of charge in just 4 minutes – assuming you have access to the necessary high powered charging facilities. All-wheel drive is expected to be standard on all versions initially, but there is the possibility of Porsche launching a more affordable rear-wheel-drive edition in the future. It also plans a crossover version of the car, as previewed by the Cross Turismo concept that made its debut at March’s Geneva Motor Show. Over-the-air updates will be possible on the Porsche Taycan, upgrading onboard infotainment systems and safety tech, but also offering to boost power if the customer wishes. The new architecture the car introduces will be used as a base for a fully electric model from Bentley. Porsche’s commitment to Taycan variants comes as part of a wider investment in the brand’s electrification strategy. The firm will double total investment up to 6bn Euros by 2022, spending on everything from a rapid charging infrastructure to hybrid and electric versions of its existing range.